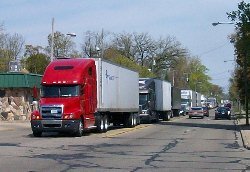 13 April, 2012, 09:37 pm in "April 2012"
It was a somewhat surreal scene today in Coldwater with semi trucks jamming Marshall St. as far as the eye could see. According to the rumors on Facebook, there was a semi truck fire on I-69, requiring that the freeway be closed for much of the day. With Michigan Ave. also closed due to construction, southbound traffic had no choice but to detour downtown. UPDATE: Click here for WTVB's update on the event.